The highlights of my travels this year were a combo of the most surprising discoveries, the most worthwhile experiences, and long-anticipated moments that finally came true. These are experiences I wish for you in 2018. If you’d like advice for how to arrange them, I can help you over at Ask Wendy. Wishing you and yours extraordinary travels in 2018! Did you know you can feed and pet elephants in the wild? We did this at the Elephant Café, an unfenced wildlife sanctuary near Victoria Falls, Zambia, that has replaced elephant rides with gourmet cuisine as a way to earn revenue to support the animals. 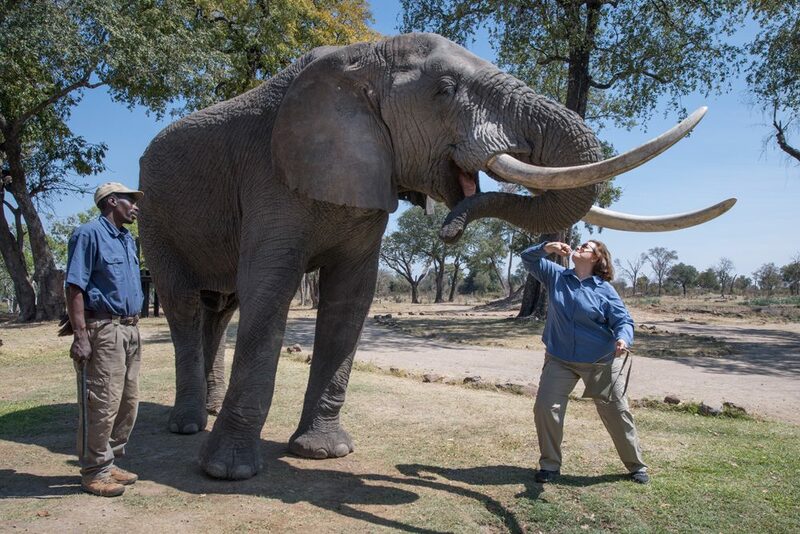 In this photo, I’ve just told an elephant “Trunk up!” so I can throw grain into his mouth. Check out the video here. For me an African safari isn’t just about viewing wildlife. It’s about meeting people from a totally different culture. When these kids in Zambia welcomed us to their village with songs and dances, of course I joined in and did as the locals do. Yes, I looked like a spazz, but it got a lot of laughs and helped break the ice. See videos from our village visit here. 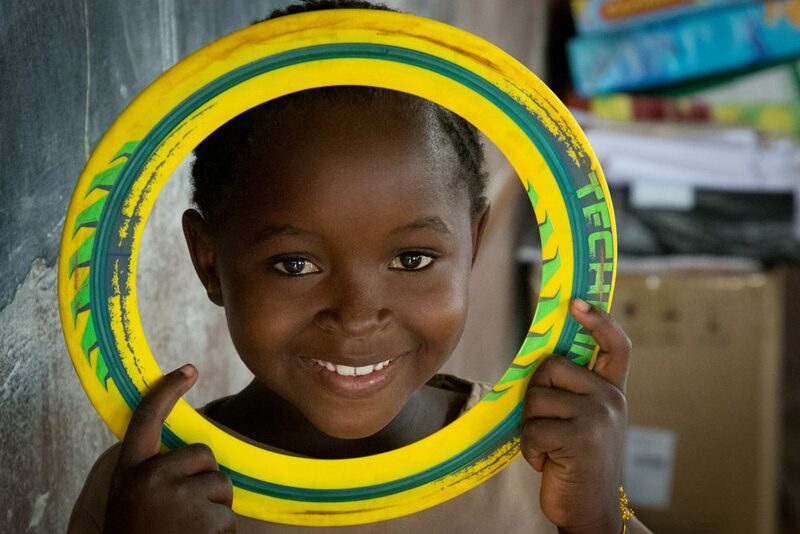 We brought school supplies and toys—including Frisbee rings—to the folks of Chiawa, Zambia. Africa travel specialist Cherri Briggs, the Trusted Travel Expert on my WOW List who arranged our safari, has spearheaded a number of life-changing community projects there. Our time in Chiawa was a highlight of our Africa trip. Here’s why. 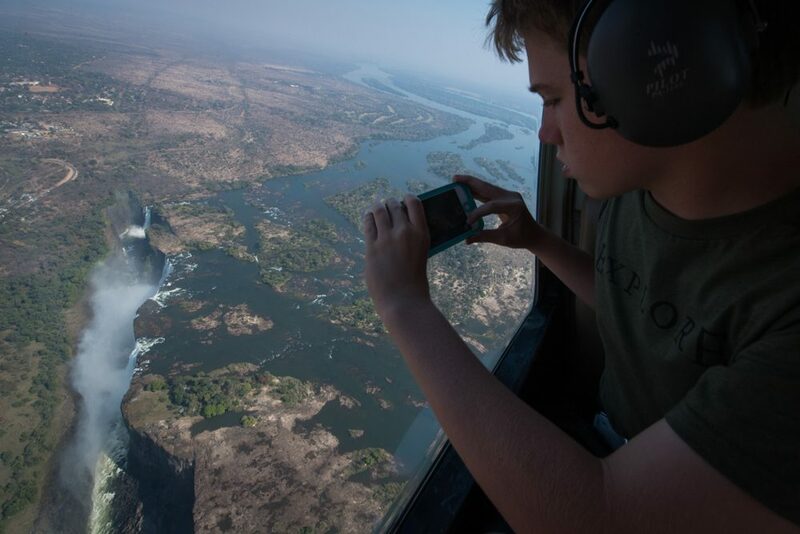 Victoria Falls, which is arguably the world’s biggest waterfall, can’t be fully appreciated until you see it from above. It’s like looking back in time because you can see the geological history of the land unfold. Watch video from our helicopter flight here. 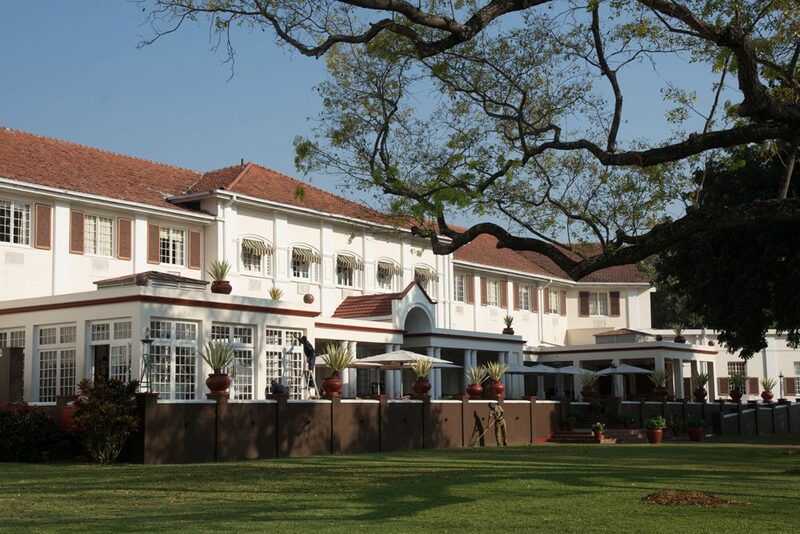 This is one of the world’s most enchanting and iconic places to stay: The Victoria Falls Hotel, built by the British in 1904. It transports you back in time to the days of B.O.A.C. Clippers and steamer trunks. You feel like you’re just one step away from Stanley meeting Livingstone. Tim and I stayed at The Victoria Falls Hotel on our first date, eighteen years ago. When we came back this year, married and with children in tow, they upgraded us to the presidential suite. 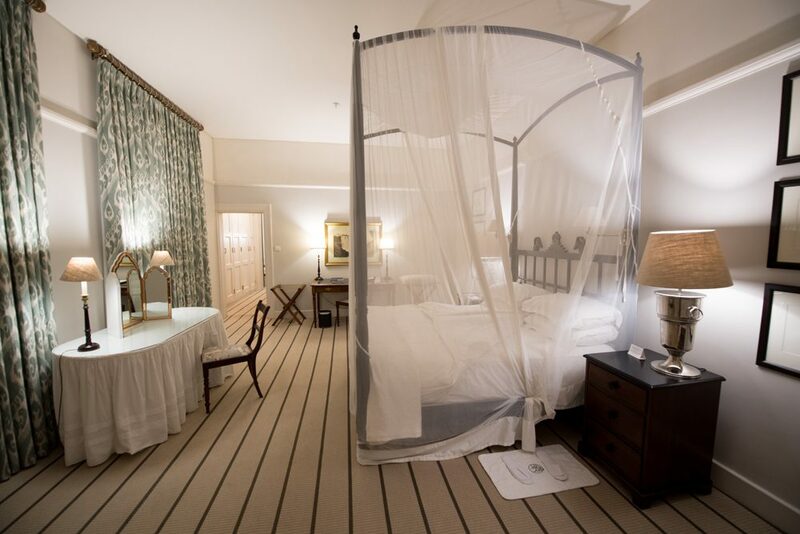 Queen Elizabeth II and Oprah Winfrey slept here too. In our ever-more-crowded world, a safari in Africa increasingly means battling other Land Rovers to jockey for the best position to see the wildlife. 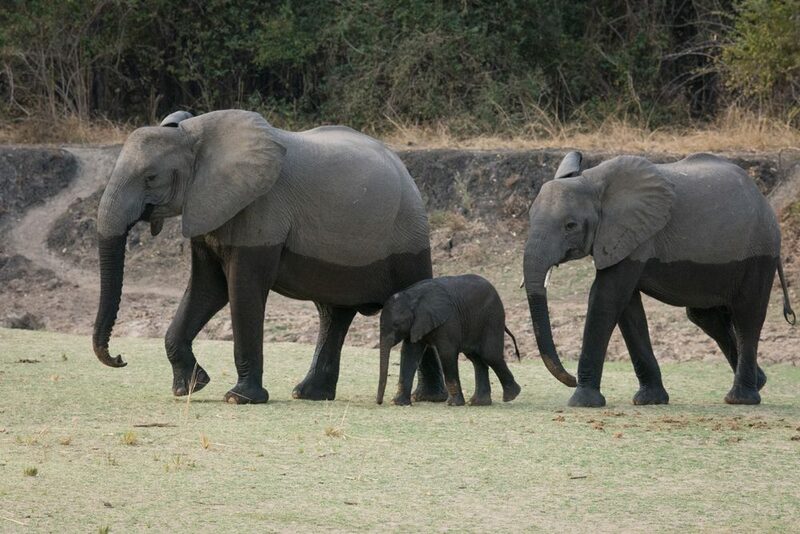 But deep in Zambia’s South Luangwa National Park, we had the animals—and the landscapes—practically all to ourselves. We were certainly the only people watching these elephants cross the river. Just by looking at them, you can gauge the depth of the water, eh? Bush brunch! It’s such a surprise when you’re on a game drive, you round a corner in the middle of nowhere, and there’s lunch waiting for you, complete with panoramic view. It’s an even bigger surprise when you get to make your own pizza! First we rolled out the dough with a rolling pin, then we sprinkled on our choice of toppings. 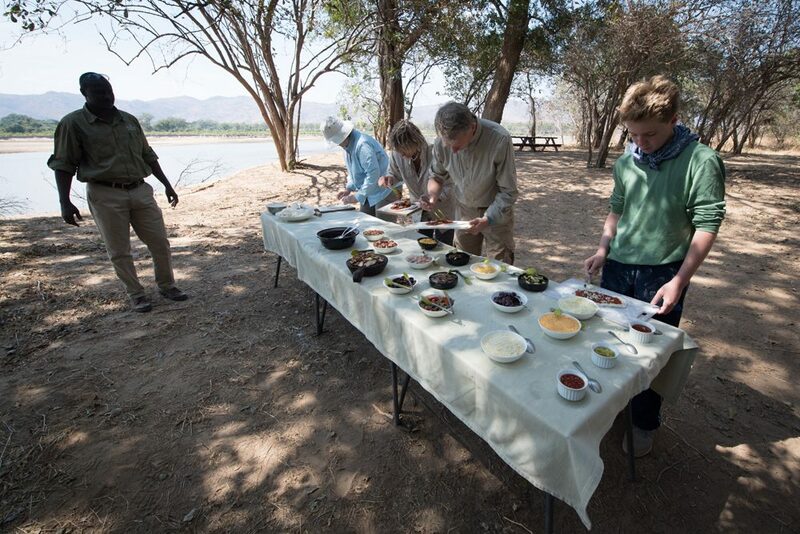 Bush brunch is one of the special touches you get at Bushcamp Company camps. For more on our extraordinary safari, see Where’s Wendy: Exploring the Next Great African Safari Spot. 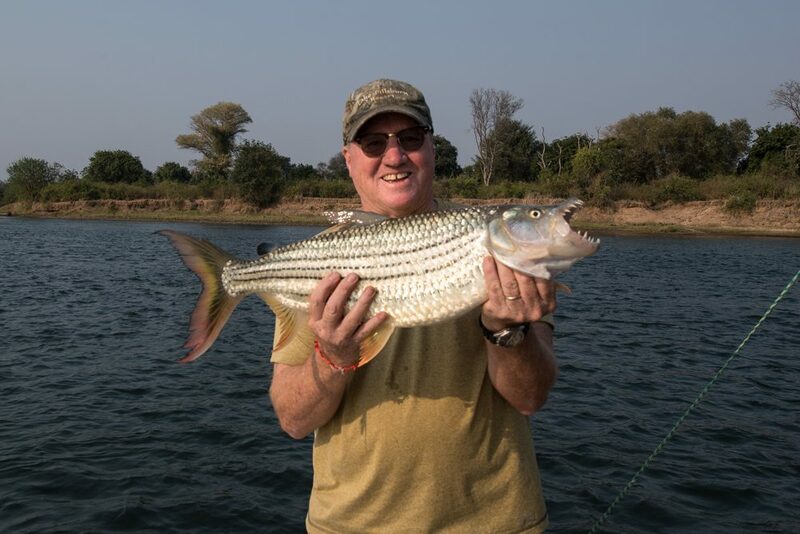 Tim’s dream was to catch a tiger fish in the Zambezi. I’ve never seen him so happy. “What kind of drums do they play in your church?” That was one of the best questions we got in Zambia. When this man asked us that question, I pulled out my laptop to show him a video I’d shot—in Bratislava, of all places—of an historic pipe organ filling an ancient church with gorgeous music. This man had never heard a pipe organ before. If you’ve never heard Zambian music before, listen here. Recognize this? 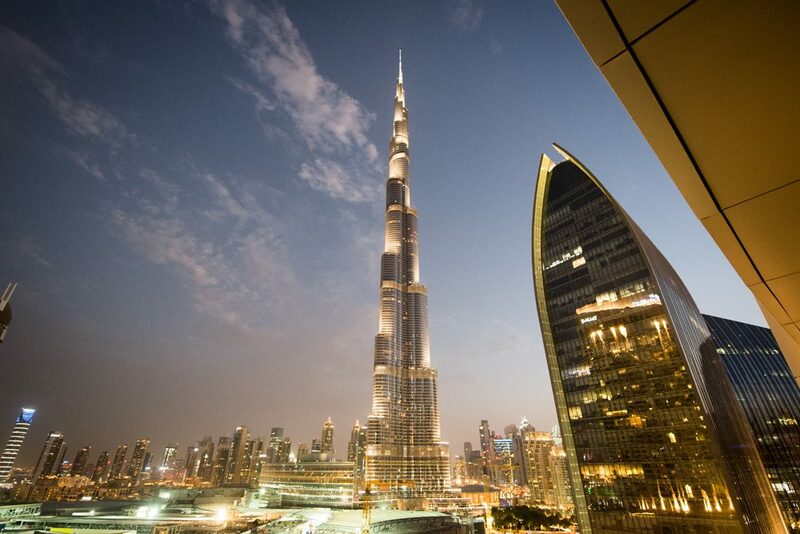 It’s the world’s tallest building, the Burj Khalifa. This was the view from my hotel balcony on an overnight layover in Dubai. Of course Lindsey Wallace, the U.A.E. travel specialist on my WOW List who made our arrangements, knew exactly which hotel and room are best when you’ve got only one night to see as much of Dubai as possible. It looks like a movie set, eh? 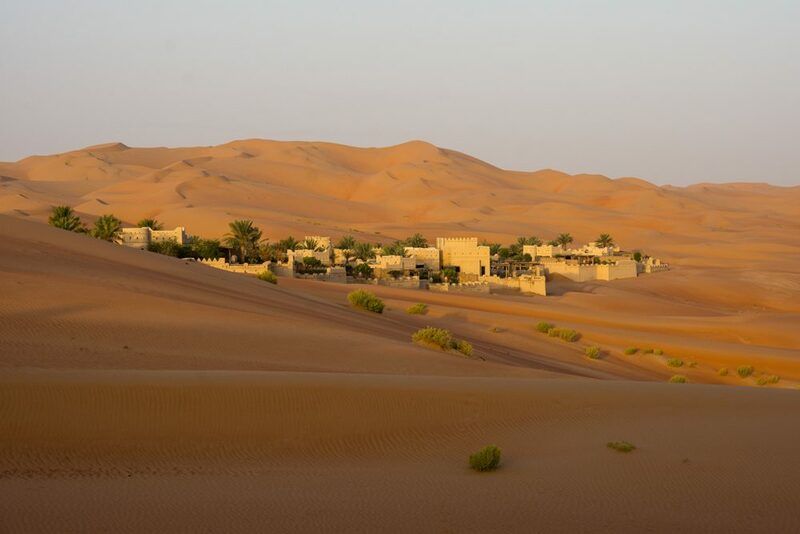 Qasr al Sarab is an oasis fit for a sheikh and dropped in the middle of nowhere in the Abu Dhabi desert, just a few miles from the Saudi border. Many people ask me how to spend a Dubai layover. My answer: Make your layover at least three nights, and spend at least two of them at Qasr al Sarab, which is only a three-hour drive from the Dubai airport. I guarantee it will transport you to another place, time, and frame of mind that you won’t want to leave. We were there in August—of all crazy times for a desert adventure—and, as much as I hate heat, we loved every minute. 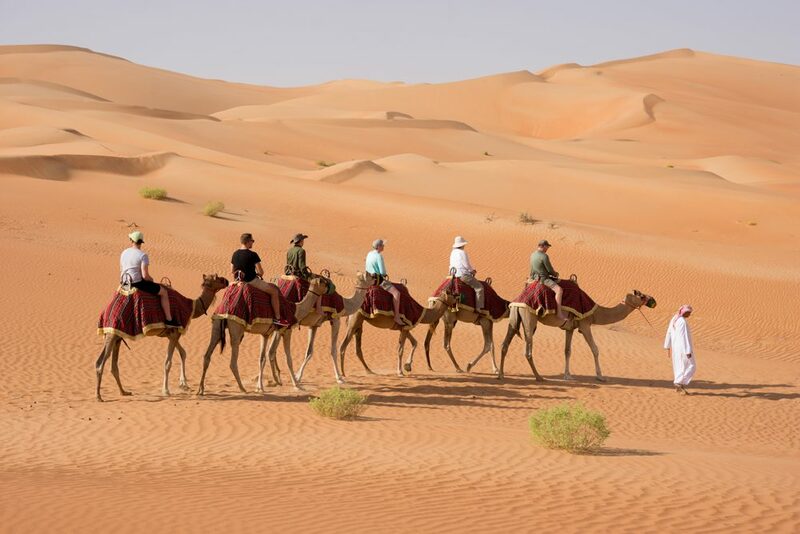 A sunrise camel ride at Qasr al Sarab is the Mercedes of camel rides. 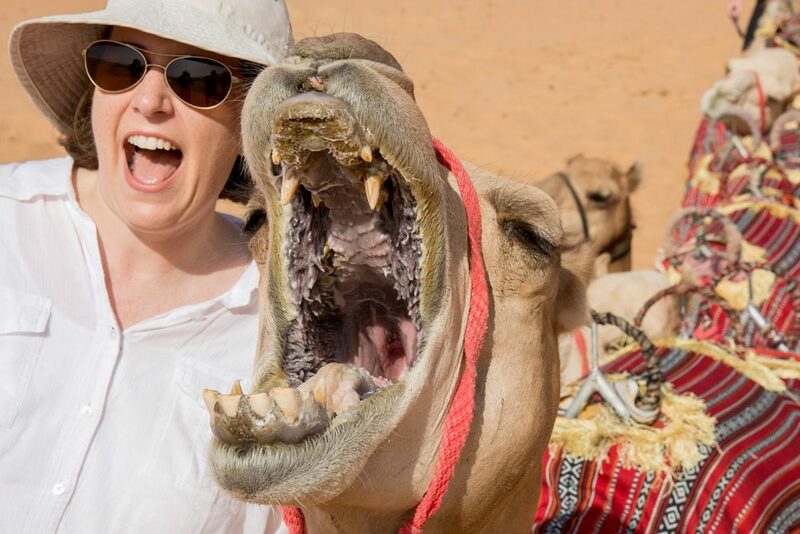 The camels are well groomed, and the tack is first-rate: The saddles are extra-comfortable, the handles are easy to grip, and there are step stools to help you on and off. 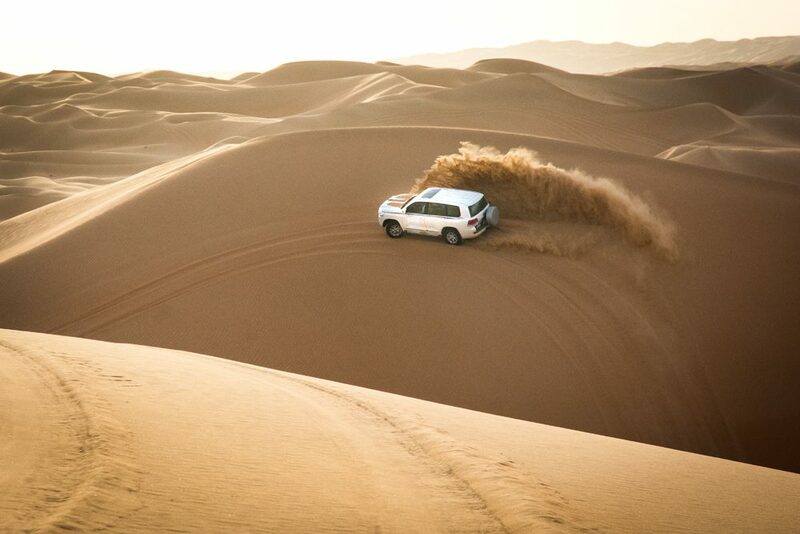 Dune bashing at Qasr al Sarab is nothing less than spectacular. If you opt for the “hard drive” (as opposed to a “soft drive”), it’s more thrilling than any roller coaster. 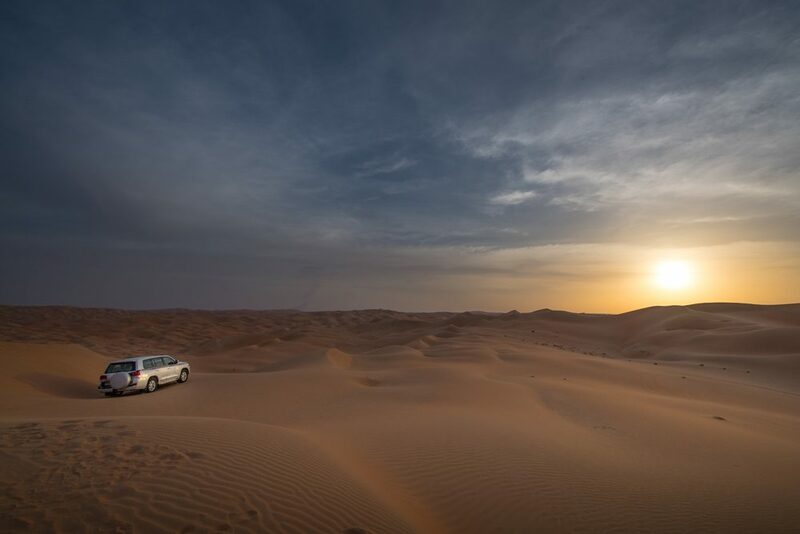 This is how your off-roading adventure ends: sunset on the dunes. The kids went swimming in the Persian Gulf for the first time. Recognize this hotel? 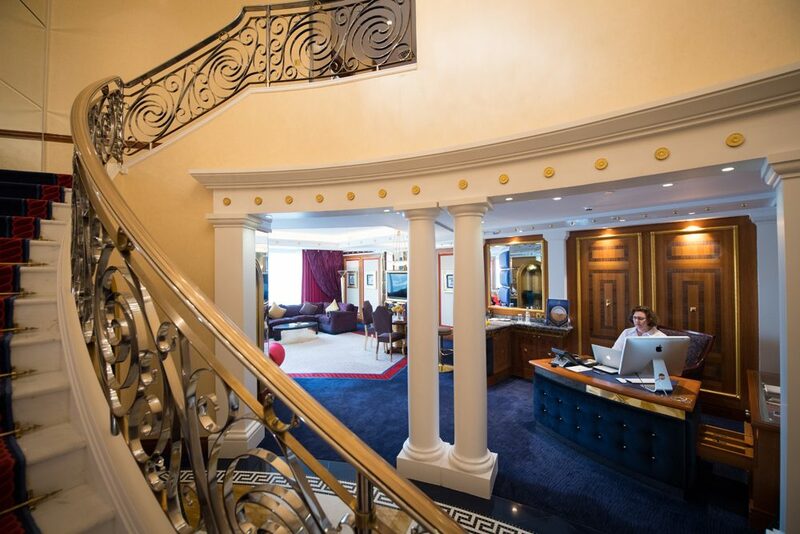 It’s billed as the world’s most luxurious—and, now that I’ve stayed there, I have to agree. It’s the Burj al Arab, where the kids hit the beach with new friends they made in Dubai. Check out our room. At the Burj al Arab, this is just your typical guest room. Each room is two stories tall and comes with its own 27-inch Apple computer and printer. 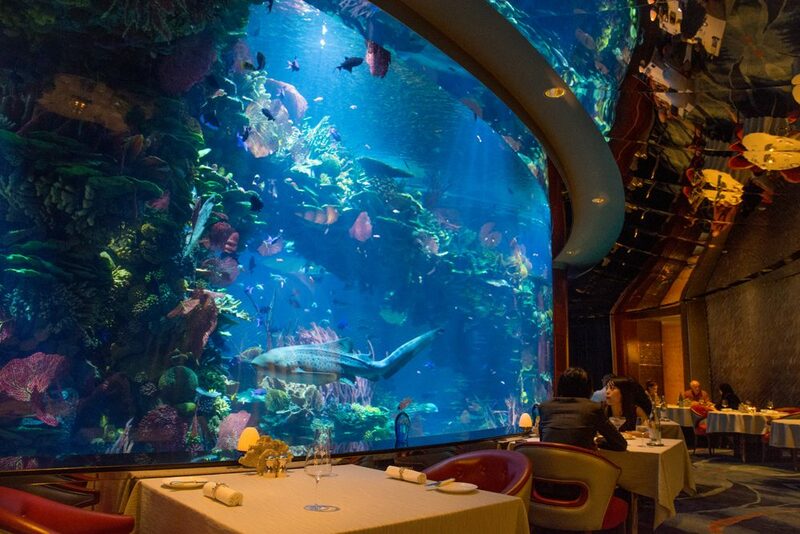 To get the full Burj al Arab experience, we dined in the aquarium that is British award-winning chef Nathan Outlaw’s Al Mahara restaurant. We were in awe of both the fish and the prices. I’d been wanting to see this for years. 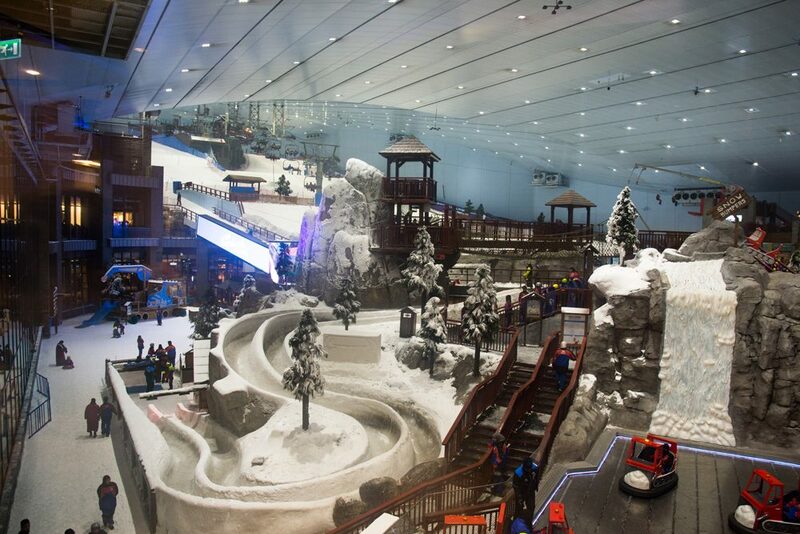 It’s Dubai’s indoor ski resort, inside a massive shopping mall. This is merely the base of the mountain. I was surprised by how much Ski Dubai looks, feels, and even smells like an actual Alpine ski lodge, from its equipment-rental shops to its chalet-style bistros serving fondue. Making a staple of local life with their hands is a good way for kids to learn about a country. 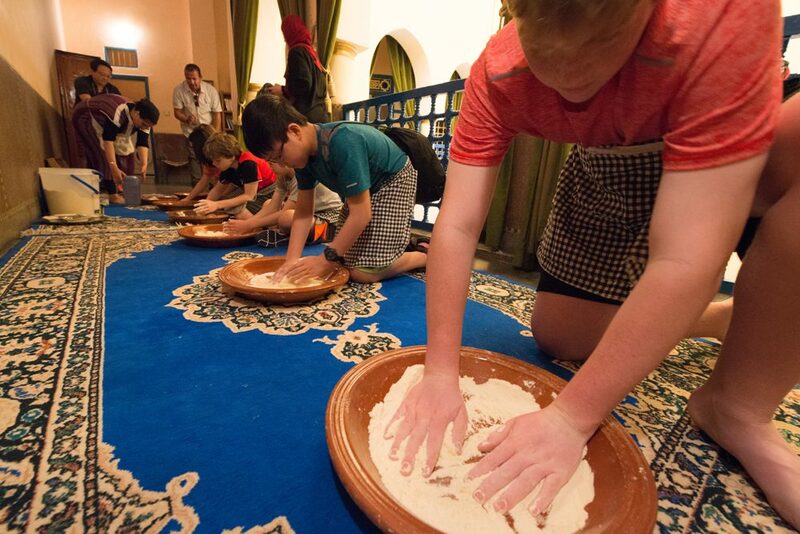 So we were thrilled when, in Marrakech, the kids learned how to make Moroccan bread from scratch, the centuries-old way. 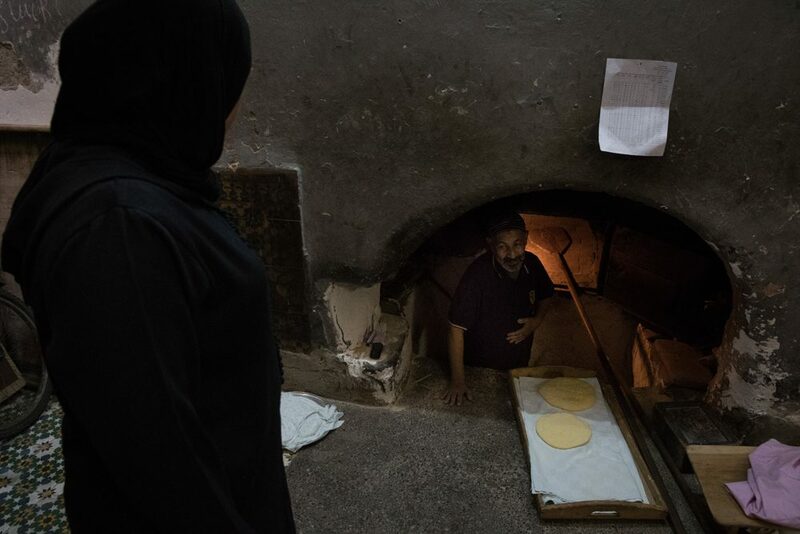 After rolling and shaping the dough, we carried it down the street to the communal oven where the whole neighborhood takes their bread to be baked. 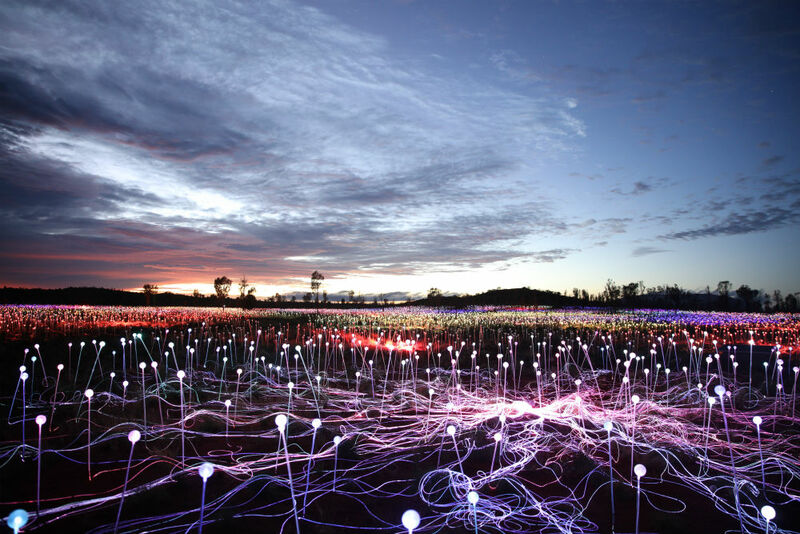 It was way cool. 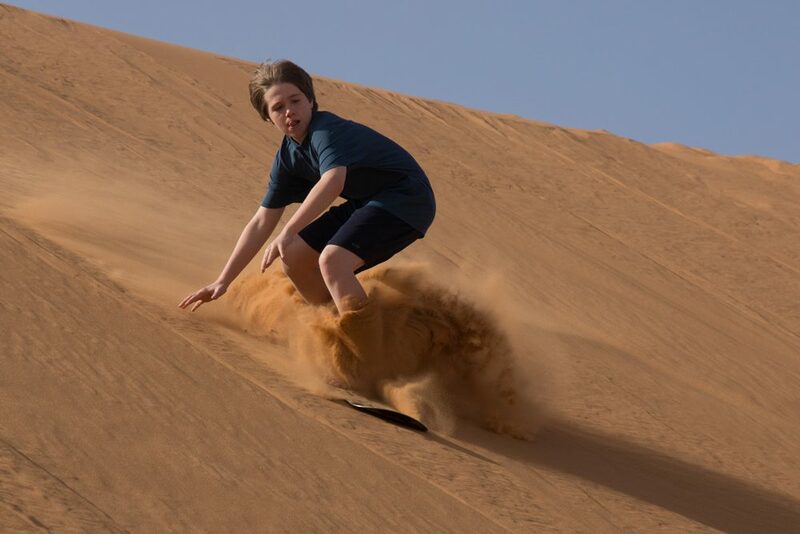 There’s Doug sandboarding in the Sahara. 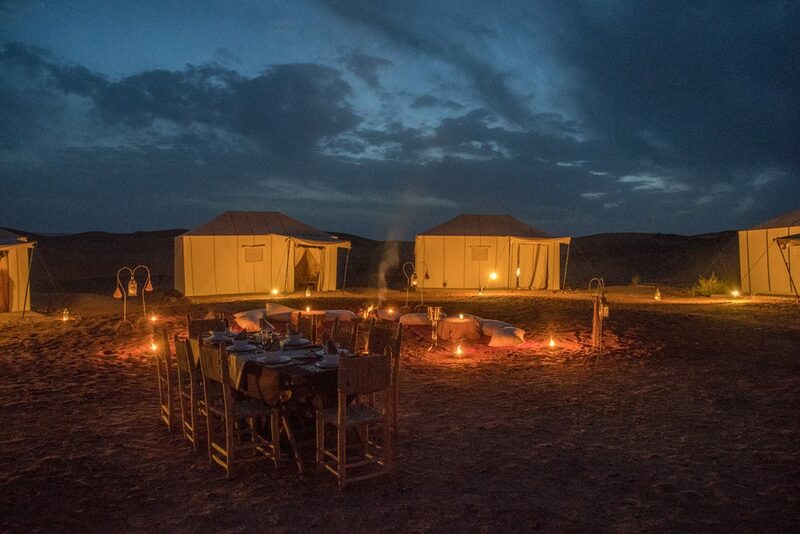 We spent a magical night at a luxe desert camp in Morocco, just a few miles from Algeria. Here’s the Sahara desert camp where we slept. We even had showers and flush toilets in our tents. 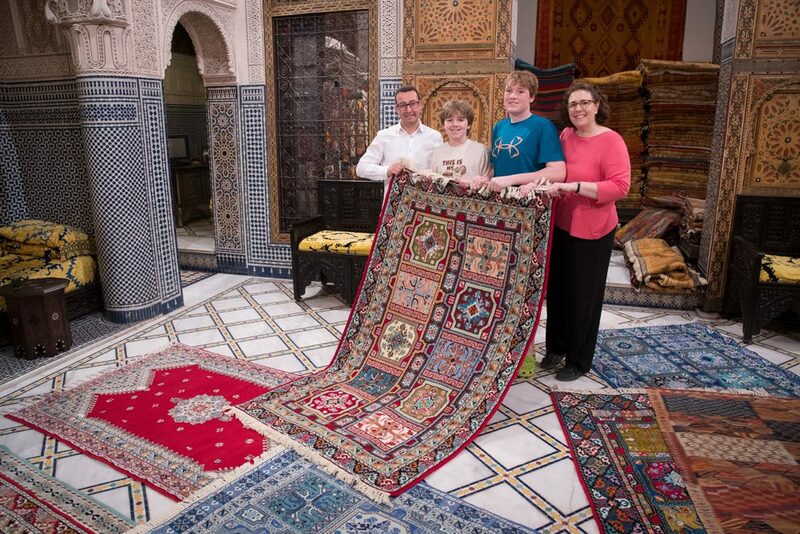 Carpet shopping has been a colorful way to experience local culture for centuries. But if you end up buying a carpet—or seven—it needs to be because you love it, not because a rug merchant persuades you it’s a wise financial investment. (It probably isn’t.) 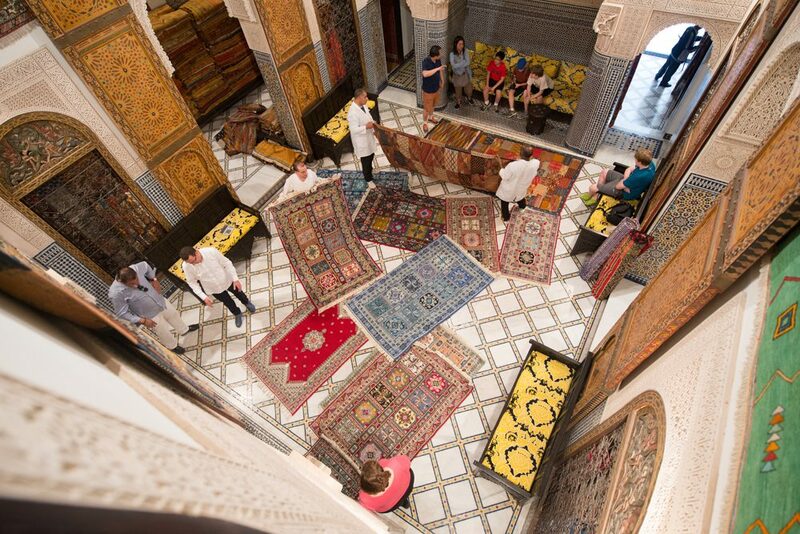 This was the kids’ first time carpet shopping—in Fez, Morocco—and the store was so theatrical about it, with men in white lab coats serving us tea and rolling out about 100 carpets in quick succession, that we had a blast. 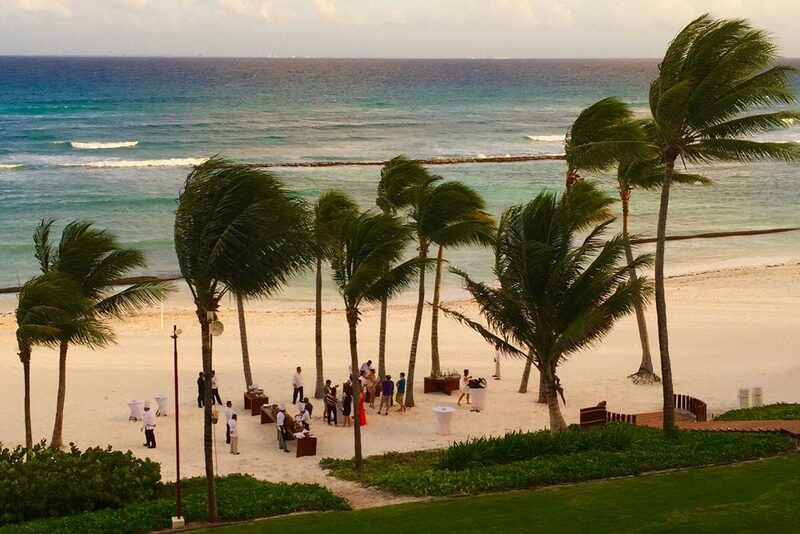 This was the moment—at Grand Velas Riviera Maya in Mexico—when the Wendy Perrin Global Travel Summit had just ended. After many long days of conference prep and hard work, we finally got to hit the beach for a Taco and Tequila Tasting. That’s colored rice! 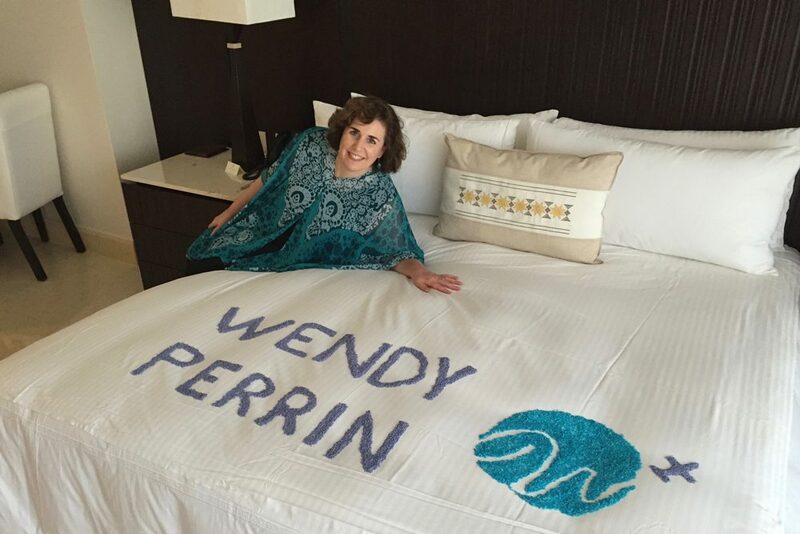 The Grand Velas Riviera Maya’s artistic staff recreated the WP logo on the bed of every Global Travel Summit participant! I get excited when a formerly gritty, crime-ridden place that people used to avoid transforms itself back into a charming city and culinary magnet. 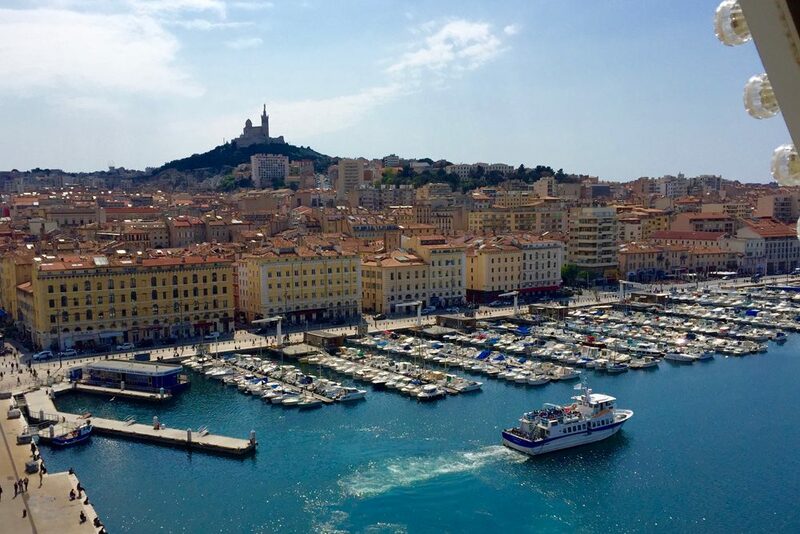 Strolling the streets of Marseille—a stop on this Mediterranean cruise—I was struck by the colors everywhere, from the building façades to the seafood dishes that thousands of people were lunching on outdoors in the early April sunshine. I shot this photo from atop the ferris wheel in the old port. This is the site of the world’s first airplane flight, in 1903. 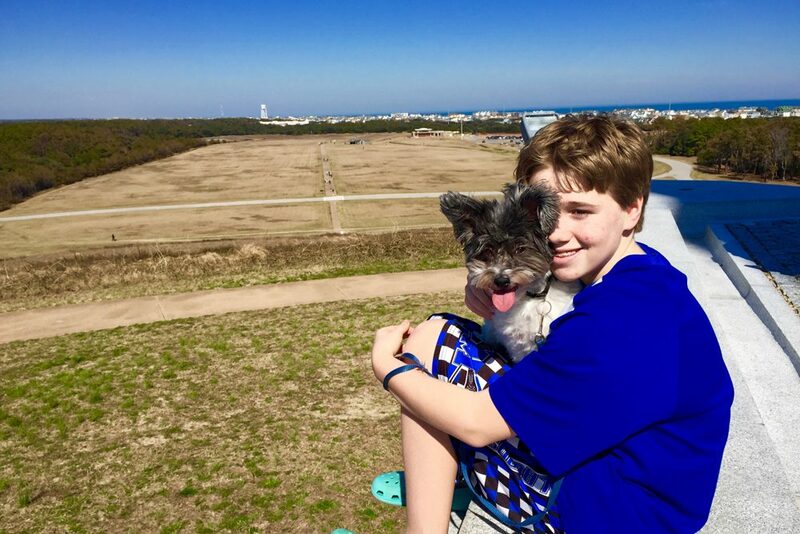 We drove to Kitty Hawk, North Carolina, for the kids’ February school break—and let me just say that February was a lovely time in the Outer Banks: The weather was great, the Wright Brothers National Memorial uncrowded. Our dog, Macy, hasn’t been on a plane yet, but she comes on all our road trips. This kitschy souvenir photo is from New Year’s Day 2017. Thanks to time-zone changes and a flight itinerary that took us more than half-way around the world, our January 1 lasted about 40 hours. We boarded our flight home from Sri Lanka shortly after midnight and landed in New York City at about 10pm on the same day. 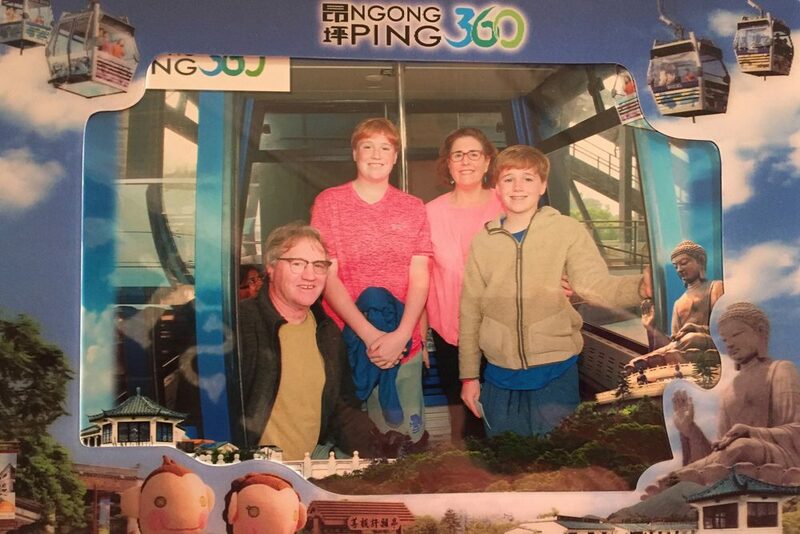 In between was a Hong Kong layover long enough for us to take the Ngong Ping cable car up to the Big Buddha. There are better ways to spend a Hong Kong layover, but after the red-eye from Sri Lanka, the fresh air and the 360-degree views of Hong Kong’s islands and the South China Sea were what the doctor ordered. Be a smarter traveler: Read real travelers’ reviews of Wendy’s WOW List and use it to plan your next trip. You can also follow her on Facebook, Twitter @wendyperrin, and Instagram @wendyperrin, and sign up for her weekly newsletter to stay in the know. So many places, so little time. That’s why we’re here with our recommendations for where to travel in 2018. Visit before the tourist hordes beat you to it. The Best Cruise Lines of 2015: Do You Agree with Cruise Critic’s Picks?